While the story is still developing, and the Prime Minister’s office seems to be backtracking from previous statements by the FPO about possible restrictions placed on journalists who participate in the illegal attempts by Hamas affiliated flotillas to break Israel’s blockade, one commenter, who goes by the moniker of TheVoiceOfIsrael, expressed, with admirable lucidity, Israel’s concerns about such activist journalists beneath Roy Greenslade’s blog, “Israel warns journalists – do not sail with Gaza flotilla”, June 27th. This has nothing to do with freedom of the press. The number of foreign journalists in Israel is relatively the highest in the world. This even includes Al Jazeera and other Arab media journalists from countries that do not even have diplomatic relations with Israel, and even from some countries that are hostile to the Jewish state. According to independent NGOs, the level of freedom of the press in Israel is among the highest in the world, and certainly higher than any other country in the Middle East (and that includes Turkey). Israel’s freedom of the press is even greater that in Italy and other western European countries. (See Freedom House/Freedom of the Press). That does not mean that journalists in Israel are not bound by the law, as are all people in Israel. If a foreign visitor or resident breaks the law in the United States they are liable to be restricted from entering the US for 10 years. It is a reasonable rule, and is similar to rules in Europe and other parts of the free world. Journalists do not get any special treatment in that respect either in Israel, the United States, or elsewhere. It is against Israel law to participate in an attempt to breach a legal arms blockade against the Hamas terrorist regime (as defined by the European Union, the US, Israel, Australia, Canada, and other countries). Any foreign national is therefore liable to be restricted from entering Israel if they do so, and any Israeli national is subject to prosecution. Some readers may not like this situation but it is perfectly legal and it is perfectly reasonable, and has absolutely nothing to do with freedom of the press. 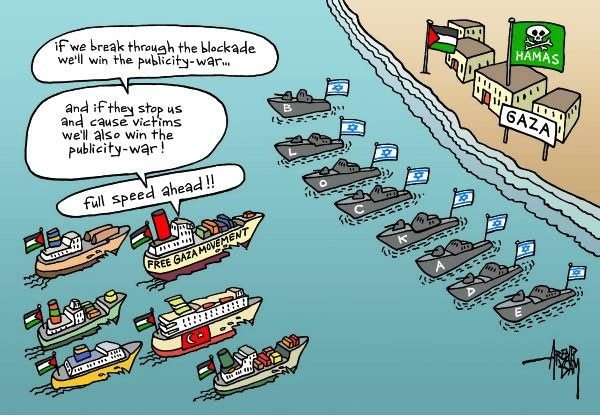 And beyond all that, it should be obvious to anyone that without the international media, the pro-Hamas flotilla would not try to breach the arms blockade. This flotilla is looking for a confrontation with Israel and all its members are really interested in is provocation. There is no value to any of their actions if there is no news media available to help them play to their international audience. In that respect, any participating members of the news media are not only breaking the law, they are also giving support and comfort to the Hamas terror organization. Now, if you happen to support the pro-Hamas flotilla (be it because you are naive, misinformed, or you just plain hate Israel), then of course you will see things very differently. But we, here in Israel don’t. The pro-Hamas flotilla will not be permitted to reach Gaza, and hopefully this time when confronted by the Israel navy, the participants will not resort to violence, so that bloodshed can be avoided. Whatever Israeli policy regarding such journalists participating in this political publicity stunt, the inclusion of anti-Israel propagandists like Mya Guarnieri and Joseph Dana on the flotillas assure that, no matter how adeptly the highly trained and disciplined Israeli Navy personnel handle the situation, Israel will be demonized. Anyone expecting anything resembling objectivity from such ideologically driven activists are beyond naive. Your comment Sencar needs to be researched more, before it can be accepted.On the index itself ” Israel (Israeli territory)” is how Israel is described. There are of course marked differences between “IsraeliTerritory” and Israel because of different security considerations, not least also because of tight restraints on Press freedom by the PA to journalists who do not believe in freedom (see below). So, when taking into account the freedom of press index, sencar, one must also take into account these factors as well. Sweden is quite high up on the index you refer us to.. Did we not see a scandalous coverage of a false report of organ transplants not too long ago ? I think we can call it antisemitism, don’t you? The Index is not reliable as one might have thought. But above Italy nonetheless – and what an achievement that is! Not in the survey I linked to. FWIW I cannot believe that Israel is ranked as low as 63. Reporters without Borders is an Islamist front and has no credibility. I was interested in your link and thought it might be helpful to see by what criteria Israel earned its relatively low rating. It seems that all Israeli claims, for example security reasons, broadcasting information to the enemy and the like are in parentheses, suggesting that RSF don’t believe them and don’t accept them. There are also inaccuracies- Israeli journalists who specialize in Arab affairs like Oded Granot from Israeli TV Channel One have gone to the the PA to interview politicians, including President Abbas. Finally, to classify the arrest, trial, conviction and imprisonment of a journalist in contact with an enemy of Israel as a breach of press freedom defies all logic and common sense. Journalist, like the rest of us, are not above the law. Even here, journalists will be pushing the envelope in Israel while carefully minding their Ps and Qs – sorry Fs and Qs – among the Arabs. Why do you thing these are untrue statements??? Guardian’s and Harriet Sherwood’s only reason for existence is to vilify Israel and glorify islamists. Therefore if Israel ever starts expelling her enemies, disguised as journalists and cultural attaches of enemy countries who have taken up residence there, they should start with her. Guardian’s and Harriet Sherwood’s only reason for existence is to vilify Israel and glorify islamists. Strange – because if you look at the Guardian’s homepage right now, not one of the 100+ stories linked to mentions Israel. Pretzelberg. I have to give it to you. Not one word. The closest I got to it is a letter published about the US Occupation,. Does that count? Pretzel, there are always exceptions to the rule. Let’s see how the Guardianistas cream their jeans when the flotilla sales for Gaza, then all the false heroes will be shouting with self-righteous indignation that they are victims of Jewish power. … if you look at the Guardian’s homepage right now, not one of the 100+ stories linked to mentions Israel. Maybe they feel they’ve done enough to poison the atmosphere for the time being. Or maybe exposing their anti-semitism is hurting their profits in the US. Who knows? They are only too aware that there is a little blog out there exposing them and commenting on every anti-Israeli article that appears. The spate of anti-Israeli artcles has dried up, and most appear without allowing comments by the hordes of angry Israel supporters who have discovered just how disgusting the Guardian’s coverage of Israel is. Perhaps even more significant is the fact that Greenslade’s blog, on this item at least, does not permit comments. I wonder of Melanie Phillips will post a rejoinder to Greenslade. A multitude of people really don’t understand the value of advertising their very own sites on web directories, no matter whether legal or other. It isn’t only from a consumer perspective but in addition Website positioning, because it gives a strong sign of authority along with commitment to the market within which these people work. Simply desire to say your article is as amazing. The clarity on your put up is simply excellent and that i can think you’re a professional on this subject. Well with your permission let me to grab your RSS feed to keep updated with imminent post. Thanks 1,000,000 and please continue the rewarding work.